The Havana Nature Center became a reality in May of 1999 after months of planning and preparation. A $500 grant from the Logan, Mason, Menard Regional Office of Education, along with generous donations from our local community groups, businesses, and individuals provided the resources to fund this project. With the help of local green thumbs and agencies, the garden was designed to attract a variety of wildlife. Local green thumbs, parents, and students worked together from the initial ground breaking work to seasonal maintenance. A natural pond, a variety of flowers and shrubs, natural areas for shelter, and an abundance of wildlife provides a living classroom with endless opportunities for learning and enjoyment. The Nature Center, complete with an Outdoor Classroom area, provides students with a chance to apply their knowledge to a natural setting. Children are able to learn much more about nature as they explore and investigate this garden. The future of the Nature Center is filled with the promise of growth and beauty. For years to come, children of all ages will interact with nature and gain an appreciation for all it has to offer. Click here for our Photo Album showing the garden's first eight years! • To develop a garden area that has an impact on the environment through conservation and preservation. • To establish an educational resource for children and adults to study and enjoy in a variety of ways. • To create an awareness of the need to establish habitat areas for various forms of wildlife that can be done easily in gardens or backyard areas. • To provide an opportunity for children and adults to work together towards a common goal. • To encourage children and adults to create backyard habitats of their own. One of my main goals for the garden was to ensure that it was a living classroom that would be used by every student in our district. Numerous lessons related to plants, animals, weather, and ecology provide district students with the tools they need to explore the environment. 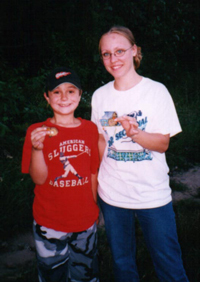 To browse sample lessons, visit the Nature Center Lessons Page. The Adopt-An-Insect project allowed over 400 junior high students to explore the world of the minibeasts. Inquiry-based insect lessons, Nature Center explorations, and a Bug Festival highlighted this school-wide project. The Pond Water Survey allows seventh grade students a microscopic view of the life found in the garden pond. Each spring the garden welcomes kindergarten students during their annual pond unit. The junior high students love sharing their knowledge of the garden with the younger children! The Nature Center lessons allow children of all ages to expand their knowledge of the world around them - building a love of nature along the way. Spring is a busy season for the Nature Center. Students, parents, teachers, and community members join forces on several weekends to prepare the garden for another season of blooms and beauty and to add new features for the students to explore. A collection of field guides, reference books, and videos for educators and students as well as supplies, tools, and equipment to provide the materials the students need to investigate the garden. A collection of over 30 native and ornamental trees! Thanks to Marc (Trimpe) Tomm, the local Boy Scout troop, the Nature Conservancy, and the Mason County Soil and Water Conservation District for their efforts to make this project a reality! Bird feeders, field guides and bluebird houses allow children to investigate the world of birds. Thanks to the Emiquon Audubon Society for their donation to make this project possible. 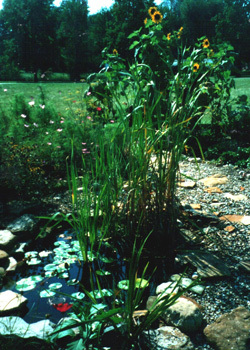 A large pond provides opportunities to investigate aquatic plants and animals. The project was funded by a Schoolyard Habitat grant from the Illlinois Department of Conservation. Thanks to Josh Irons and the local Boy Scoot troop for providing a beautiful water garden and a variety of aquatic life to investigate in our Outdoor Classroom. In addition to the pond, the Havana CUSD #126 Board of Education donated the funds to provide a picket fence around the garden. NOTE: Thanks to Cass Cable for drilling a tunnel to provide electrictiy to the garden! Students added a variety of milkweed plants to create a special area for Monarch butterflies! They enjoyed collecting caterpillars and watching them transform into adults. As a member of the Monarch Watch program, students were able to tag the butterflies before releasing them in the garden. Junior high students held a penny drive during the annual Bald Eagle Days Festival in our community to raise money for books and other educational materials about bald eagles for the Nature Center library . The penny drive also provided the money needed for a live bird show and allowed us to adopt an eagle! Mrs. (Trimpe) Tomm's Accelerated Science students will create garden guides for elementary students in Kindergarten-2nd grade students as well as 3rd & 4th grade students. The garden guides will be used to highlight 10 areas of the garden and provide facts about the garden plants and wildlife. Thanks to the Havana Federation of Teachers for a $50 grant to purchase wooden posts for the garden as well as other materials that will be used to make the garden guides. Mrs. McDaniel's 5th grade students added a small pond area and waterfall as a home for tadpoles. The 5th grade students study frogs throughout the year and learn about their life cycles, habitats, and conservation issues. Thanks to Robert Stockham and the local Boy Scout troop for building a pergoula over the patio in our garden. It provides much needed shade and we will be adding vining plants to attract hummingbirds and insects. An assortment of prairie plants will allow students to explore the beauty and history of our state. Thanks to Earthskin Nursery for their promise of an assortment of prairie plants to make this project possible. Each fall we participate in the Monarch Watch tagging project and recruit lots of big and little helpers, such as the (Trimpe) Tomm and McDaniel familes. During the fall/winter of each year we will be participating in the Classroom Feeder Watch project sponsored by the Illinois Audubon Society. Thanks to our local chapter, Emiquon Audubon Society, for their support of this project! If you have any questions about the Nature Center project, please use my contact form!